Louis Anthony Cordileone was born August 4, 1937 in Jersey City. A quick and powerful athlete, he was both smart and street smart, handling himself in a rough Jersey City neighborhood and in the classroom at St. Michael’s School in Union City. Lou was a power-hitting outfielder, ferocious tackler and unstoppable fullback for St. Michael’s. As a senior, he scored 20 touchdowns and converted 8 point-after attempts. Clemson’s Frank Howard was among the many college recruiters monitoring Lou’s progress. He signed the hulking teenager to a scholarship in 1956. 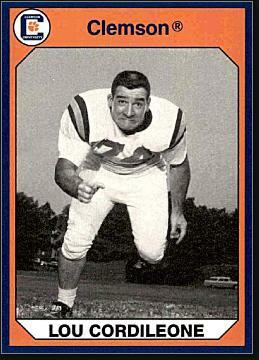 Lou distinguished himself as the team’s best two-way tackle as a sophomore in 1957. The Tigers went 7–3 and quarterback Harvey White was the ACC’s top passer. They improved to 8–3 in 1958 and 9– in 1959. Clemson achieved a Top 20 national ranking in all three seasons of Lou’s varsity seasons. As a senior in 1959, he was named First-Team All-American and First-Team Academic All-American—the first time in school history an athlete had earned both honors in the same season. The Tigers were ACC champs in 1958 and 1959. Lou was also the first Clemson player invited to participate in the East-West Shrine Game and the Hula Bowl, which had a post-season all-star format until 1960. Lou also played for the Clemson baseball team, and participated in the 1959 College World Series. At 6’1” and 260 pounds, Lou projected as a difference-making offensive guard in the pros. He was the last player picked in the first round, by the New York Giants. He was also drafted by the Buffalo Bills, who were preparing for the American Football League’s inaugural campaign. Lou signed with the Giants and started a handful of games as a rookie. During training camp the following August, he was traded straight-up for Y.A. Tittle of the 49ers—one of the great trades in Giants history. 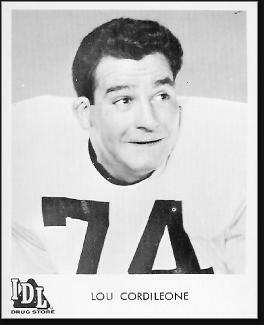 When the 49ers informed Tittle that he had been traded, he reportedly said, “who the hell is Lou Cordileone?” Lou’s response was “Damn it! They traded me for a 42-year-old quarterback!” He was joking; Tittle was only 34. The 49ers dealt Lou to the Rams after 1961, and they traded him to the Steelers two weeks into the 1962 season. In 1963, he started 13 of Pittsburgh’s 14 games but was released after the season. Lou worked odd jobs and played semipro ball in 1964. In 1965, he played minor-league football with the Rhode Island Indians of the newly formed Continental Football League. In 1967, Lou joined the expansion New Orleans Saints. He played guard and defensive tackle for two seasons before calling it a career. Lou stayed in New Orleans, where he ran a number of businesses, including a bar, before moving to Southern California. While playing for the Rams, Lou had landed a part as a sheriff through an agent friend on the Chuck Connors TV series Branded. He hadn’t thought much about acting after that, even after friends joked that he should test for The Sopranos. In 2011, Lou tried out for a reality show called Forever Young, which put five people over 70 and five under 3 in the same home. He won the job and the series aired on TV Land for a year. He was so natural on camera that some suggested he should test for The Sopranos. In 2016, Lou received the long-overdue honor of being inducted into the Clemson Athletic Hall of Fame.